A joint venture between EverWest Real Estate Partners and WHI Real Estate Partners L.P. (WHIREP) has earned unanimous approval by the Scottsdale City Council for a zoning modification, and has started construction on The Quad, a major 13-acre, 14-building redevelopment project that blends elements of a lifestyle center and office park to create a next-generation creative office community. 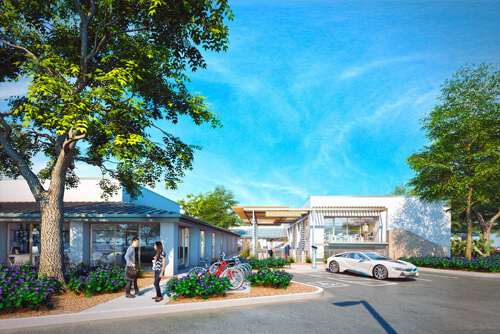 The project is located at the northwest corner of 64th Street and Thomas in Scottsdale, Ariz.
Over the next six months, EverWest and WHIREP will transform The Quad (formerly Scottsdale Executive Villas) into 166,606 square feet of creative office space across 14 stand-alone buildings. 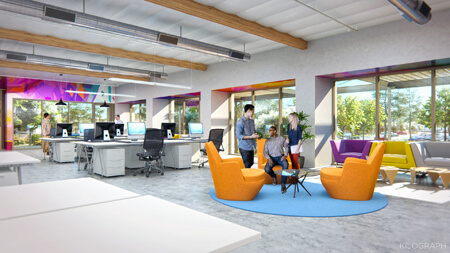 Office suites will range from 2,000 to 12,500 square feet, and include private outdoor workspaces and sliding patio doors that create a true indoor-outdoor work environment. Buildings at The Quad will be connected by park-styled courtyards and seating areas that EverWest will activate with free, property-wide Wi-Fi. Along with shell delivery, EverWest and WHIREP will build out six speculative creative suites totaling approximately 38,000 square feet. These suites will be equipped with open style collaboration spaces, focus rooms, huddle rooms, standard glass offices, open ceilings, break rooms, coffee bars and an innovative finish palate. A central, 4,500-square-foot gathering facility called The Q will anchor The Quad, providing tenants with state-of-the-art conference and event space, a full catering kitchen, private tenant liquor cabinets and lounge seating that can accommodate activities ranging from corporate training to holiday parties. The Q will also include a tenant-exclusive fitness center with showers and lockers, and an on-site full service restaurant. The owners are in discussions with several popular, local restaurant operators interested in the space. The Quad maintains a direct connection to the Cross-Cut Canal multi-use path, and will incorporate a striped lane to transition cyclists from the paved path to The Quad property, where there will be multiple bike parking areas. The pet-friendly campus will also offer dedicated, fenced-in dog parks for those wanting to bring their pets to work. The Quad is located approximately three miles from the Loop 101 and Loop 202 freeways, two miles from Old Town Scottsdale and is minutes from Sky Harbor International Airport, Arizona State University and downtown Tempe. The architect for The Quad is Denver-based Gensler. The general contractor is Phoenix-based RSG Builders. Bryan Taute and Charlie von Arentschildt of CBRE are the project’s exclusive leasing brokers. Other active EverWest redevelopment projects in Arizona include The Madison in Phoenix, The Forum in Gilbert and, most recently, The Circuit, a 185,000-square-foot adaptive reuse project in Tempe that was recently 50 percent leased to New York-based health insurance company, Oscar.